Since beginning this career change journey and immersing myself in the tech community I learned some really cool things I’d forgotten about myself. 1. I still like stickers. Yep! Stickers. Further it’s OK to like stickers. Even grown men like stickers in the tech community. Who would have thought at my age I’d have a renewed affinity for all things stickers. 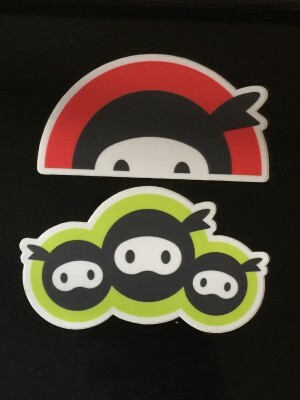 I love stickers so much, one of my favorite things to do at a conference or meet-up is to ask the sponsor or speak if they have stickers to give away. If by some chance they don’t have a sticker, then I’ll accept a t-shirt. AJ and I go on sticker hunts if we see one we especially like. Thanks to this past couple of months I’m building quite a collection I must say! You can take this lady out of paper crafting but you can’t take the paper crafting out of the lady. 2. When I get lost inside myself, focusing on the needs of others eases my stress. AJ and I were talking one evening about the stress and struggles of learning to code on our own. We were lamenting on the challenge associated with feeling overwhelmed and pushing through even when we’ve reach the peak of frustration. In my effort to empathize and offer a helpful suggestion I mentioned a strategy I use to feel a little less — stupid. When I’m stuck I go to one of the many forums to which I belong and look for questions I can answer. When I admitted to AJ I often use the forums to feel better, I was feeling a bit bashful. I realize I only do it to help my self esteem but she made me realize in my ‘selfishness’ someone else is helped. So, I guess it isn’t anything to be ashamed of after all. 3. I still take too long to ask for help. It was my upbringing that supports my perfectionism and my unwillingness to ask for help. Even when something is really hard I tend to bang my head against a wall before asking for help. I thought I’d given myself permission to not know everything. But, I guess I haven’t. I still bang my head against a wall. I still struggle to exhaust every option of gaining knowledge on my own before asking for help. Yet, on Free Code Camp I’m learning it’s ok to have help. There is an expectation in the community that a camper will pair with another camper to complete tasks. The point of the exercise is to get comfortable working with others remotely. I must admit. I’ve only tried it once thus far. I still feel a bit of shame at asking for help. But this week I’ve been struggling with regular expressions. But….I can’t pass the challenge. I look at the list of red x’s to find out why and I’m still plugging away at it like the words don’t tell me it won’t pass because I haven’t used a regular expression (regex) in the solution. SMH. So now again my streak seems halted while I work through figuring out regex. I took the regex tutorials in the former FCC curriculum but I didn’t understand it. I’ve downloaded at least 7 books on regex and even read some of them. But I don’t understand it. With horror I realize, I’m going to have to ask for help. But, before I do…there is always, YouTube. After spending a day searching and watching YouTube videos I realize I’ll be looking for a pairing partner to get through this challenge. I let you know how it turns out. I’ll keep you in mind for some stickers! Awesome to hear that you’re pursuing a coding career. Thanks, Tyler! I see you’ve been doing really well also.